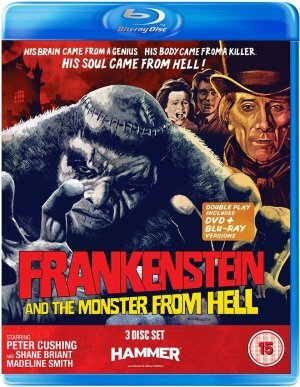 Frankenstein and the Monster from Hell was made in 1972 and is the last Hammer film dealing with the famous character of Dr. Frankenstein. Starring Peter Cushing, the film was slightly censored in UK cinemas and even more so for the home video release. Until now, the longest version available worldwide was the German DVD by Anolis since it seems to be identical to the UK theatrical cut. However, Hammer managed to bring the film back to its original form for the Blu-ray release and even extend it by a scene that was previously only included in the censored version. It is thus now the longest version of the film worldwide. The bonus section features an audio commentary, the making of, a feature about director Terence Fisher and a picture gallery. The 3-DVD/BD set is out in the UK on April 28th, 2014. You can order it at Amazon.co.uk.